Hey, hey! The kids and I are enjoying our last day in Montana before heading back to real life tomorrow (meaning a 10+ hour drive followed by piles of laundry and yard work and potential stinkpot attitudes, not excluding me, from being entertained 24/7 by Grandma and Grandpa the last 10 days). So I’ll keep it short and sweet today so we can soak up every last minute of family time. Let’s talk tacos for half a sec, shall we? Mojo, per the recipe title, is referring to the Cuban-style flavors in this recipe (garlic, orange, olive oil) and is pronounced moh-hoh. Not to be confused with the more slang mojo (moh-joh), although I suppose you could get your mojo back (assuming you’ve lost it) by making and serving these tacos to a special someone. They are good enough to impress, that’s for sure. 1) don’t overcook the pork: there’s a fine line between raw pork and perfectly cooked, juicy pork. That line is 145 degrees F. Using an instant-read thermometer (like this one) can make the difference between average pork and restaurant-worthy pork. 2) use really good tortillas: homemade or good-quality storebought. I’ve talked about it before – the small corn and wheat tortillas from Trader Joe’s are my faves. But if you can’t get them or prefer other varieties, the rule of thumb should be to use a corn or flour tortilla that tastes awesome, ok? 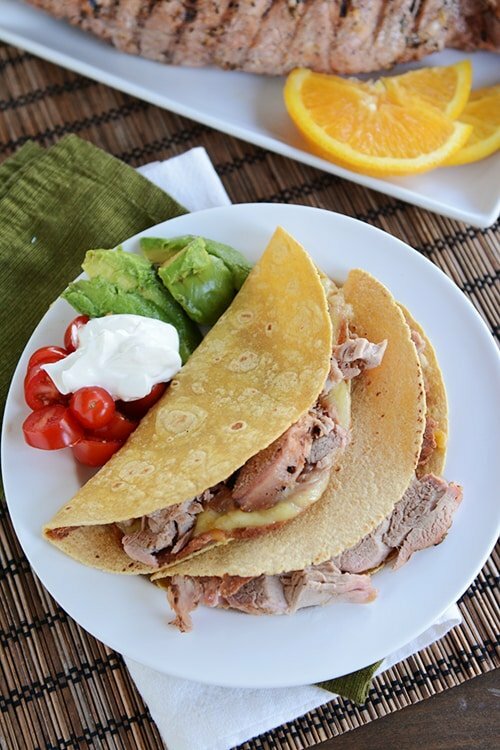 3) slice the cooked pork thinly: these tacos rely on those tender, succulent slivers of pork to wow your taste buds. And of course, you could use that creative culinary mind of yours and eat this deliciously flavorful grilled pork in a million other ways than tacos, too, if you like. Go crazy. I will say that they are absolutely divine as pictured: corn tortillas slathered with refried beans, melty Monterey Jack cheese and stuffed with pieces of juicy pork. Before I forget (so much for being short and sweet – story of my life! ), these freeze amazingly well. I assemble the tacos, flattening them just slightly with the palm of my hand into a a pressed half moon and then wrap each one individually in plastic wrap. Several tacos will fit in a gallon-size ziploc bag and make for tasty, quick lunches (I unwrap before heating up). In a medium bowl or large liquid measuring cup, whisk together the orange juice, orange zest, lime zest, lime juice, olive oil, garlic, oregano, salt and pepper. Place the pork tenderloin in a shallow dish or in a large ziplock bag and pour the marinade to cover the pork. Refrigerate and marinade at least 4 hours and up to 24 hours. Preheat a grill to medium heat (about 350 degrees F if you have a temperature gauge or thermometer) and grill the pork tenderloin for 15-20 minutes, flipping halfway through, until the internal temperature of the thickest part of the pork registers 145 degrees F on an instant-read thermometer. Let the pork rest for 5-10 minutes before slicing thinly. 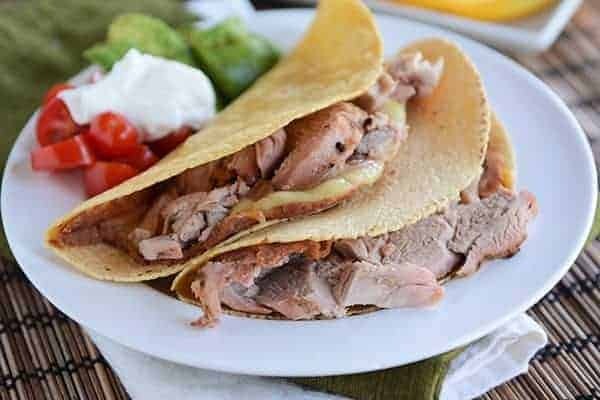 Serve the pork with warm corn or flour tortillas and whatever taco toppings you like. 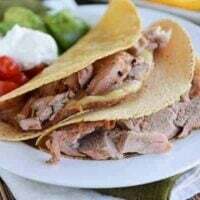 They are also delicious with a layer of refried beans spread on the tortillas and covered in Monterey Jack cheese (warmed in the oven until the cheese melts before adding the pork and toppings). I included this note in the last step of the recipe but I'll restate: these grilled pork tacos are also delicious with a layer of refried beans spread on the tortillas and covered in Monterey Jack cheese (warmed in the oven until the cheese melts before adding the pork and toppings). To freeze, I assemble the tacos, flattening them just slightly with the palm of my hand into a a pressed half moon and then wrap each one individually in plastic wrap. Several tacos will fit in a gallon-size ziploc bag and make for tasty, quick lunches (I unwrap before heating up). Next Post » How to Get Mel’s Free eCookbook! I made these Pork Tenderloin tacos over the weekend and they were delicious! The marinade + grill flavor was the BEST! I will definitely be making them again! Have you ever tried this in the pressure cooker? How did/would you cook it? I haven’t, but I’m guessing it would work great. I’d probably cook it at 15 minutes high pressure if it’s cubed. Mel, for whatever reason I am scared of grills. I saw the note to try in the oven. Just curious if you think it would work in a slow cooker. Maybe start in the slow cooker and finish off in the oven to brown it? Thoughts? BTW, I am about the pickiest cook/foodie and I haven’t tried one of your recipes yet that my family doesn’t absolutely LOVE. Made the ham and potato hash last night and my husband wouldn’t stop moaning. Thank you for helping me please the tastebuds! Thanks, Dannah – so happy you are loving the recipes! I think you could definitely make this in the slow cooker although it will obviously have a slightly different texture than the grilled option. The flavor should still be delicious though! These are delish! I’ve made them twice already. Try some of trader joes sweet chili sauce on these. So yummy! Amazing recipe Mel! I just made these (along with Honey-Lime Fruit Salad, crockpot refried beans, and perfect corn on the cob). The 8 hungry humans in my home, varying in ages from 1 – 54 years, consumed it all with delight. Quite simply a miracle. The adults raved over the flavorful tender pork. The kids kept asking “more meat, please!”. Thanks so much for ALL your stellar recipes! Mel, grilling is not an option for me. Could the mojo pork be made in the oven? Temp. and approx. time you would recommend? Hi Donna – yes, for sure! I’d probably roast the pork tenderloin in a foil-lined pan at 350 degrees for 20-30 minutes (until the internal temp is 145 degrees F). Thanks Mel for the ecookbook! You are the best! You always inspire me to make great recipes! You are very welcome, Kari! Thank you Mel. Have fun on your vacation! These may be on my table tonight for dinner! If not tonight, tomorrow! Thanks for all the yummy recipes! I love all your pork tenderloin recipes and I see this being another favorite. I just need oranges. Thanks for the e-cookbook, Mel. What a great selection of recipes you chose. You rock! Thank you so much for the e cookbook!! I am loving your site and I appreciate all the time and effort you have put into it,especially while being a very busy young mom! Love the idea of freezing. One of our favorites is your Bean Wraps taken right out of the freezer, heated, and so delicious. These types of recipes really, really helps to have nutritious meals on hand during the hectic days of summer. Thank you! Thanks Mel for the e-cookbook. You are the very best. Thank YOU, Debbie – so kind of you to check in and say thank you! These look amazing, Mel! I love that they freeze well. Safe travels home! Thank you very much for the e-cookbook. What a great gift! You are so nice to take the time to say thank you, Linda – that meant a lot to me! I’ve been a little bit un-inspired in the dinner department lately, so yes, these tacos would SO help me get my mojo back on. Yum!! Yum! Can’t wait to try these Mel!! The corn tortillas in your photo look homemade and beautiful. Am I seeing correctly, or are those from trader joes? If you ever get the hang of making good corn tortillas, I’ll look forward to learning it! I just make a mess of them. We do love our homemade flour tortillas though! Hi Barbara – yes, the tortillas are Trader Joe’s in the pictures. I need to perfect making them at home! Recently I found the raw corn tortillas at Costco that you heat up on a griddle just like the flour tortillas they’ve had for years and they are amazing. Great idea for tacos!!! Perfect for a summer meal! !